Choose a color to accent your room! Please call us at 1-800-900-0759 if your skylights were purchased prior to 2010. Need to change the amount of light you get from your FS/FSR skylight? There are a variety of blinds to choose just the right light for your room. Accent your room with blinds in a color of your choice. Control the light and heat that enters your room using only the power of the sun! Our innovative design is operated by remote control and requires no wiring and no electrician. If you already have a Velux Fixed Skylight but you're in need of a Solar Powered blind, this is the what you are looking for. These blinds will fit Velux fixed deck mount (FS or FSR) skylights manufactured in 2010 or later. 30% federal tax credit - The American Recovery and Reinvestment Act of 2009 established a 30% tax credit for the purchase and installation of photovoltaic property installed between January 1, 2009 and December 31, 2016. There are two types of solar powered blinds available, blackout or light diffusing blinds. Both types are available in different colors. Special order colors are available in a larger variety of color and take about 2 weeks to deliver. The blackout blind can convert day into night excluding even the brightest sunlight, which makes it perfect for rooms that require total room darkening such as bedrooms or TV/entertainment rooms. Perfect for afternoon siestas and light summer nights. If you choose a VELUX blackout blind, you will enjoy total blackout plus optimal heat protection. Maximum light blocking - tight design and light blocking fabric block sunlight so that less than 2% enters the room. Glare control - eliminates direct sunlight to significantly reduce or eliminate glare on your TV or computer screen, which increases the versatility of the room. Energy efficiency -The blackout blind has an energy efficient aluminum coating on the exterior side that acts as a heat barrier, increasing energy efficiency up to 20% and reducing your heating and cooling costs due to the better natural climate control in your room. No longer is direct sunlight an issue. With the new VELUX light diffusing blind, soft, diffused light is all that will enter your room. Perfect for rooms when softer light is desired such as kitchens and bathrooms. If you choose a VELUX light diffusing blind, you will enjoy the benefits of natural light without glare. Light diffusing material - tight design and light diffusing fabric allows soft, diffused light to enter the room. Glare control - diffuses direct sunlight to significantly reduce or eliminate glare on your TV or computer screen, which increases the versatility of the room. Energy efficiency -The light diffusing blind increases energy efficiency up to 16%, reducing your heating and cooling costs due to the better natural climate control in your room. 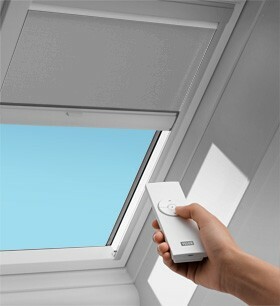 Installation of a VELUX blind has never been easier. With the new innovative Pick&Click!™ brackets blind installation is a snap! Most VELUX skylights comes pre-installed with Pick&Click!™ brackets that allows for fast and easy installation of sunscreening blinds and accessories. Solar Powered blinds include a remote control for easy operation! IF YOUR SKYLIGHT IS PRE-2010 THESE WILL NOT FIT. If you are unsure of the age of your skylights, please call us to find out how to identify your skylight. ALL BLINDS ARE NOT RETURNABLE OR REFUNDABLE.